The First (18th-19th centuries)-farmers became small urban manufacturers. Think iron, textiles and the steam engine. The Second (1870-1914)-electric power allowed small urban manufacturers to become large urban manufacturers, especially, steel, oil and electricity. Highlight was the development of the internal combustion engine. The Third (1980s-today)-aka the Digital Revolution-the advances from analog electronic and mechanical devices to digital technology. People suddenly rely on computers, a cell phones and the internet. The phrase 'Fourth Industrial Revolution' was first coined by Klaus Schwab, Executive Chairman of the World Economic Forum in 2016, and introduced the same year at the World Economic Forum. 4IR is characterized by "the fusion of technologies that is blurring the lines between the physical, digital and biological spheres". In other words, The Jetsons. Think robotics, artificial intelligence and the internet of things. Think additive manufacturing and 3D printing on steroids. Now lets talk about the lean concept "Jidoka". 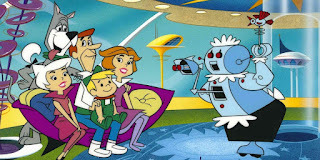 which is defined as autonomation or "automation with a human touch". I suppose this very narrow definition comes from the story of how Sakichi Toyoda (Toyoda Automatic Loom Works LtD) in the early 1900s invented a self-stopping loom that avoided the hours and hours of untangling woven fabric. Watching people struggle to untangle fabric bothered Toyoda, and believed that work to be disrespectful to human beings. Which brings me to what jidoka really means: RESPECT FOR PEOPLE. The goal of a lean strategy is to leverage operational excellence to create market disruption by methodically eliminating the 8 wastes. People do more productive work and much less waste (non-value added work). Companies successful in lean see huge improvements in productivity (often measured as sales/labor hour). The 4IR will be marked by quantum, exponential leaps in productivity (our ability to do more with the same human effort). More important, the 4IR can result in quantum leaps in human's quality of life. My friend Lenord Hahn of Ulbrich Steel alerted me to a 15 minute Ted Talk you may enjoy where Kai-Fu Lee discusses how artificial intelligence can save our humanity. More and more, humans will be doing fulfilling human work and machines will be delegated to repetitive, tedious tasks! Stay tuned for Part 2 of this discussion, which will talk about the 4IR and the concept of Nemawashi. Don't Build Your Church for Easter Sunday!